The official portraits of President Barack Obama and First Lady Michelle Obama were unveiled Monday at the Smithsonian’s National Portrait Gallery in Washington D.C.
President Obama’s portrait was painted by Kehinde Wiley, a Yale-trained artist known for his depictions of African-American subjects. 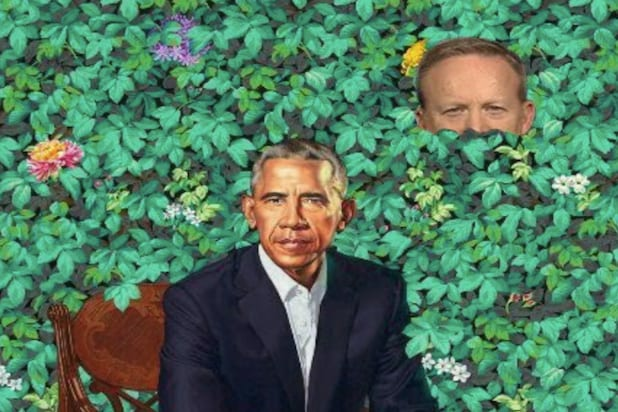 The painting shows the former president sitting pensive in a brown chair amid shrubbery and flowers. The First Lady was done in a more muted style by the artist Amy Sherald and depicted her sitting, with a Mona Lisa-like expression, gazing out beyond the canvas. Both were the first African-American artists to paint official portraits of a first couple. Online, the Twitter commentariat were unsparing, with critics blasting the images as bizarre and unrepresentative of the Obamas.